Ford plans a European launch for the EcoSport, shown, within 18 months. AMSTERDAM -- Ford Motor Co. will launch two new SUV/crossover models and the Mustang sports car in Europe as part of a product offensive to counter slumping sales in the region. 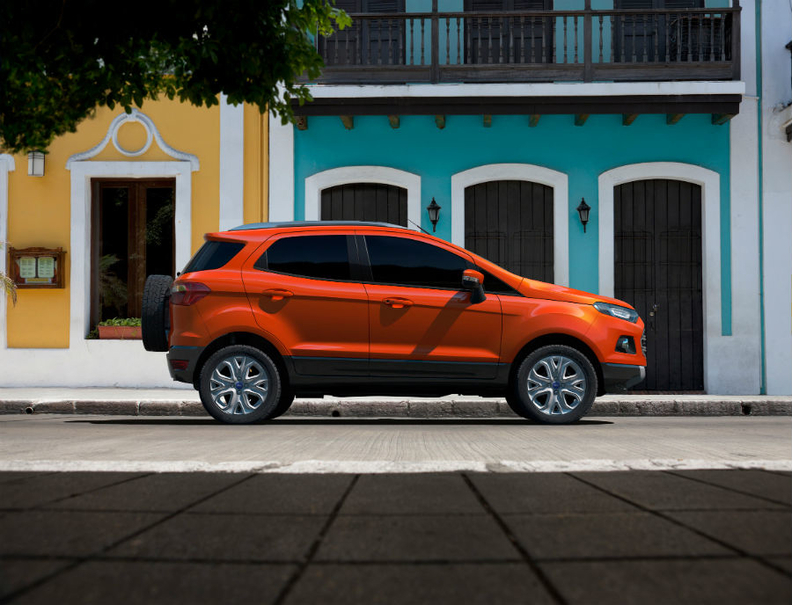 Ford plans to launch European sales of the EcoSport small SUV within 18 months. The model, already on sale in India, will join a growing segment where rival General Motors Co. also plans new entrants, the Opel/Vauxhall Mokka and Chevrolet Trax. Europe will also get a redesign of the U.S.-market Edge, a larger, more premium SUV. "The expanding European SUV market is a unique opportunity for Ford and lands right in our sweet spot," Jim Farley, Ford's global marketing and sales chief, said today at an event here. "No other company can touch Ford's expertise, global portfolio and credibility when it comes to SUVs." The EcoSport and Edge will join Ford's SUV lineup alongside the Kuga, Europe's No. 2-selling compact SUV after the Volkswagen Tiguan. Ford forecasts that the European SUV market will increase by 34 percent over the next five years. The automaker expects to sell more than 1 million SUVs in Europe in the next six years with SUVs accounting for one in 10 of all Fords sold in the region by 2016. The next-generation Mustang high-performance coupe and roadster will also be officially sold in Europe, Ford said. Currently private retailers import the car into Europe from the United States. Within five years, Ford plans to have 15 global vehicles on sale in Europe. These include the new-generation Mondeo mid-sized car, which is a version of the U.S. market Fusion, a face-lifted Fiesta subcompact and a range-topping sporty Fiesta ST. The new Mondeo will be sold in Europe with three body styles: a sedan, five-door hatchback and a station wagon. It will be offered with Ford's downsized 1.0-liter gasoline engine to better compete with rivals such as the Volkswagen Passat and Opel Insignia. The Mondeo will also have all-wheel-drive variants with diesel engines when it goes on sale next summer. Ford will also fully redesign its only cash cow in Europe, its commercial vehicle range. The Transit, Transit Custom, Transit Connect and Transit Courier -- plus a family of new Tourneo people carriers -- will be redesigned over the next two years. Ford CEO Alan Mulally is positive about Europe despite the region's deepening economic crisis, which is keeping car buyers out of showrooms. "Even with the near-term business environment, Europe presents a significant opportunity for profitable growth," he told 2,500 European Ford dealers and employees here today. In July, Ford said it expects to lose more than $1 billion in Europe this year. Mulally said Ford will turnaround its European business just as it did in the United States with new products developed through the One Ford plan. Ford of Europe CEO Stephan Odell said the European market is clouded at the moment by the economic crisis but the region holds potential for profitable growth. He predicted that the total European car and light commercial vehicle market, including Russia, will grow 20 percent in the next five years to 23 million vehicles. "While others are backing off or cutting product investments, we at Ford are accelerating the introduction of new products, leveraging our One Ford global strengths," Odell said. Ford also said it plans to have 3.5 million vehicles on European roads by 2015 equipped with its SYNC in-car connectivity system.